Shop the KASCO line of all purpose band saw blades online in our store! The hardened tooth Large Volume/Heavy-Duty Atlanta band blade offers the strength and durability to stand up to the rigors of high-volume and heavy-duty operations. It has the integrity to consistently deliver straight and sharp cuts over a longer period of time compared to other band blades. 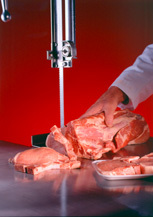 KASCO all purpose meat band blades are engineered for precision slicing and reliability. 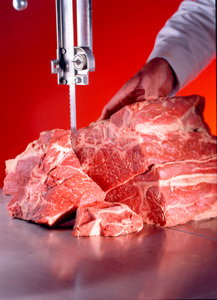 One Way Portion Control band saw blades are engineered for efficient portion control cutting of fish, beef, pork, and lamb. The controlled set and unique tooth shape cut produce minimum kerf and less waste. These band saw blades are ideal for an optimum finish on smaller cuts of meat and for standard speed machines. All KASCO one way portion control band saw blades are engineered for precision slicing and reliability. The original Swift Tooth bands reduce noise and create a quick, quiet, and clean cut time after time. The blade combines the aggressiveness of a 3 tooth blade with the surface finish of a 4 tooth blade. All KASCO Swift Tooth bands are engineered for precision slicing and reliability. The Stainless Toothed band blade is exceptionally durable while providing a fast and smooth cut. 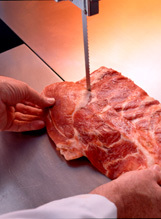 This meat cutting blade meets the strict sanitation requirements and is NSF Certified. It's made of high quality stainless steel for a longer life and easier cleaning. All KASCO Stainless Toothed band blades are engineered for precision slicing and reliability. 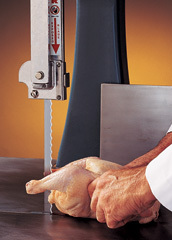 Scallop band saw blades are designed to effortlessly cut through boneless and processed meats, cheese, and very soft bone material such as chicken. This blade saw blade slices smoothly and quickly without leaving residual chips or waste behind. The scallop can also double as a slicer. All KASCO Scallop band saw blades are engineered for precision slicing and reliability.